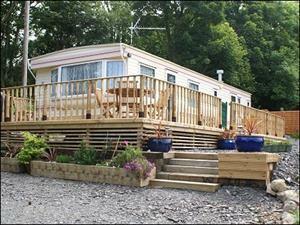 Holiday Caravan @ Fedwen Holidays01239 811333work Alternative AccommodationFedwen Caravan at Tresaith is a Bluebird Charisma with double glazing and full central heating and can sleep up to 6 people plus 1 babies in cots. Located in a private area within the grounds of the owners smallholding, the caravan has sea views down the valley being just a few minutes drive to Tresaith Beach. From the caravan, a footpath runs through the woods down to the beach. There is a wraparound newly installed wide timber deck with railings and gate making this an ideal caravan for a family with children. In the lounge there is a 24" flat screen TV with free view and built in DVD player. Comfy wraparound sofas seating 6 (including a sofa bed with bed linen provided) and dining area seating up to 6. Gas fire in lounge area also radiators throughout the caravan. •All electricity and gas inclusive of price, radiators throughout. •Fully enclosed deck with table, 6 chairs and a bench. •One cots available plus a high chair. •This is a non-smoking caravan. •Short breaks available by arrangement, 3 night minimum.